As I have pointed out in my „Nihon-shintô-shi“, there are basically two approaches about the origins of the Ishidô school. One says that the Ishidô ancestors were successors of Bizen smiths like Katsumitsu (勝光), Munemitsu (宗光) and Yoshitsugu (吉次) who had followed the army of Akamatsu Masanori (赤松政則, 1455-1496) to his field camp at Magari (鈎) in Ômi province when the latter was fighting for the Ashikaga (足利) against the local Rokkaku family (六角). For example the contemporary early to mid Muromachi period chronicle “Inryôken-nichiroku” (蔭凉軒日録) lists apart from Katsumitsu and Munemitsu about 60 smiths following the army in question. The other approach names a concrete smith, namely Sukenaga (助長) who was active around Meiô (明応, 1492-1501). This article seeks to shed some light on this Sukenaga. First of all I would like to take a chronological look at the transmissions concerning Sukenaga. It seems that he does not appear in the sword books before the late Edo period at all. It all starts with the “Kotô-mei-zukushi taizen” (古刀銘尽大全) published in Kansei four (寛政, 1792) which says that he was a student of Takagi Sadamune (高木貞宗), the son of Takahiro (高弘), active around Jôwa (貞和, 1345-1350), that he signed with „Gôshû Gamô-jû Sukenaga“ (江州蒲生住助長), and that there were local smiths with that name also later active around Meiô (明応, 1492-1501). Further it says that his sons were Sukehisa (助久) and Suketsugu (助次), his grandson was Sukeyoshi (助吉), and his great-grandson was Murayoshi (村吉). Apart from that it also lists Sukemitsu (助光) as Gamô smith. Next the „Honchô-kaji-kô“ (本朝鍛冶考) published in Kansei eight (1796). The relevant section starts with the statement that the Gamô smith Kanro Toshinaga (甘呂俊長) was the student of Takagi Sadamune, followed by a listing of Sukenaga right below with the comment that he became a student of Toshinaga during the reign of emperor Go-Komatsu (後小松天皇, 1377-1433, r. 1392-1412) and after the Eitoku era (永徳, 1381-1384) and that he was from Bizen but lived at the Ishidô-ji in the Gamô district of Ômi province. Not mentioning Sukehisa, the smiths Suketsugu, Sukeyoshi, Murayoshi and Sukemitsu are listed in the same way as in the “Kotô-mei-zukushi taizen”. Now we come to the “Kokon-kaji-bikô” (古今鍛冶備考) published in Bunsei three (文政, 1820). This work says that works signed with „Gôshû Sukenaga“ have their roots in the Bizen Fukuoka-Ichimonji school as this smith was a late descendant from the lineage of Fukuoka-Ichimonji Sukemune (助宗) who was active around Jôji (貞治, 1362-1368) and Ôan (応安, 1368-1375). Further it says that works signed with „Gôshû Gamô-jû Sulenaga saku“ have their roots in the Bizen Osafune school as this smith, who was also a later descendant of Ichimonji Sukemune, moved to Ômi province to settle before the gates of the Ishidô-ji (石塔寺) in the Gamô district as his lineage was declining in Bizen. The entry ends with the comment that this Ishidô temple is also written with the characters (石堂) and (石道) and that Sukenaga, supposedly active around Meiô (明応, 1492-1501), was thus the ancestor of all the later Ishidô schools. The „Kôsei Kokon-kaji-mei hayamidashi“ (校正古今鍛冶銘早見出) from Kaei two (嘉永, 1849) follows basically this entry but says that Sukenaga was active around Ôei (応永, 1394-1428). However, it also says that there exists a blade dated Meiô eight (1499, picture 1), that he came originally from Bizen and that he was the ancestor of the Ishidô school, next to the info that „Ishidô“ was also written with the characters (石堂) and (石道). Picture 1: The mei in question from the “Kôzan-oshigata” (光山押形). So we can see a certain change in these references. Initially (~ 1792), Sukenaga was just considered to be a student of Takagi Sadamune but soon (~ 1796) the theory was forwarded that his roots were in Bizen. Later on (~ 1820) the approach with Takagi Sadamune was completely dismissed and more attention was paid to the Bizen origin as it was now stated that he was a late smith from the lineage of Ichimonji Sukemune and that he was the ancestor of the Ishidô school. Let us take a look at the workmanship. The “Nihontô-taikan” comments in the blade dated Meiô eight (1499) that some works from that time are extant and that they display a workmanship similar to contemporary Mino blades. Also Okada (岡田) writes in his “Gôshû-tôkô no kenkyû” (江州刀工の研究) that the Muromachi-period Sukenaga works do not display and Bizen-like workmanship but resemble more Yamato or Hokkoku blades. Before we continue and for a quick overview, I want to present in picture 2 a blade from about that time. It is signed “Gôshû Gamô-jû Sukenaga”, has a short nagasa of 59,7 cm, a relative deep sori of 2,05 cm, and a comparatively short nakago of 13,0 cm. It tapers noticeable and displays a high shinogi. So all in all we have here a typical uchigatana of around Eishô (永正, 1504-1521) and Daiei (大永, 1521-1528). The kitae is a densely forged ko-itame with masame in the shinogi-ji, chikei and some shirake. The hamon is a ko-gunome mixed with chôji, some togari elements, a noticeable amount of ko-ashi and yô and kinsuji. The nioiguchi is somewhat subdued and quite narrow and all in all the elements of the hamon are rather densely arranged. Well, Okada speculates that Sukenaga came from the lineage of Takagi Sadamune, namely based on the transmission that the latter bore in his early years the name „Sukesada“ (助貞). That means he sees a connection via the same character for „Suke“. And Okada, Ogasawara Nobuo (小笠原信夫) and Iida Toshihisa (飯田俊久) suggest that the whole Bizen approach must be treated with due caution. Kondô Hôji (近藤邦治) in turn, the head of the Gifu branch of the NBTHK, sees a connection to Mino, based namely among other things on the interpretation of the character for „Ga“ (蒲生) in „Gamô“. Sukenaga chiselled namely the lower right vertical stroke of the radical (甫) in an elongated manner, a peculiarity which can also be seen at some Mino smiths like Jumyô (寿命) or Kanetsune (兼常) (see picture 3). That means let us take a look at Mino. Mino bordered on Ômi province and in the lineage of the so-called „Nishigôri“ or „Saigun smiths“ (西郡) we find a similar name, namely those of Sukemune (助宗). The Nishigôri/Saigun lineage goes back to Tofuji (外藤) and gave rise to the Jumyô lineage of which Sukemune was the supposed 7th generation. The Saigun genealogy says that Sukemune was the son of the 6th generation Munetsugu (宗次) but also that the 8th generation Muneyoshi (宗吉) was also the son of Munetsugu. In short, Sukemune and Muneyoshi were brothers, and the succession of the latter implies that Sukemune had no son. Another brother of Sukemune was the Kakitsu-era (嘉吉, 1441-1444) Mino smith Suketsugu (助次). And there exists the transmission that Sukenaga was the son of this Suketsugu. Suketsugu´s successors moved later to the Gamô district of Ômi province and as mentioned in the beginning, Sukenaga´s son bore the name „Suketsugu“ too. Now let us face the circumstances from the point of view of then warfare. I have said earlier that about 60 Bizen smiths came with the army of Akamatsu Masanori, the then shugo military commander of Bizen province, to Magari in Ômi province. It is assumed that some of them stayed there when the campaign of Chôkyô three (1489) was given up when Ashikaga Yoshihisa (足利義尚, 1465-1489) died on a disease in the field camp in Magari at the young age of 23. But not only Bizen smiths were hired to accompany those armies fighting against the Rokkaku. There is the theory that Saigun Sukemune accompanied the then Mino shugo Toki Masafusa (土岐政房, 1457-1519) in Chôkyô two (1488) to Ômi. Also Masafusa fought then for shôgun Yoshihisa against the Rokkaku. This theory is supported by the meikan records which list a signature of Sukemune under his name “Jumyô” made in a field camp during the battle of Aonogahara in Mino province (Aonogahara ni oite go-jin saku, 於青野ケ原御陣作). Aonogahara was located at present-day Ôgaki City of Gifu Prefecture, i.e. about 15 km to the south of Saigun. But the Toki and Rokkaku were closely related by marriages and adoptions of heirs and it is possible that some Saigun smiths like Sukemune moved to Ômi in the course of a peaceful exchange of craftsmen. Later and when things got more complicated, their names were probably removed from the records as the Toki tried to minimize exposure against the shôgun. Personal conclusion: The workmanship and signature of the Meiô-era Sukenaga is similar to contemporary Mino-mono. There is the transmission that his supposed father Suketsugu´s successors moved to the Gamô district of Ômi. There was a certain connection between the Mino, i.e. the Saigun smiths and Ômi province. There is no signature of these smiths known which actually mentions the Ishidô temple. On the other hand, Osafune smiths came at about the same time to Ômi too. There was the well-nown Kamakura-period lineage of Fukuoka-Ichimonji Sukemune. Later when the ancestry of the Ishidô school was investigated, they had no blades signed „Ishidô-ji“ but blades from that area, i.e. from the Gamô district, signed by Sukenaga. Maybe they discovered that Sukenaga was the son of Suketsugu who in turn was the brother of Sukemune. Maybe they did not have the information that this Suketsugu/Sukemune lineage was from Mino as contemporary data was destroyed by the Toki family. 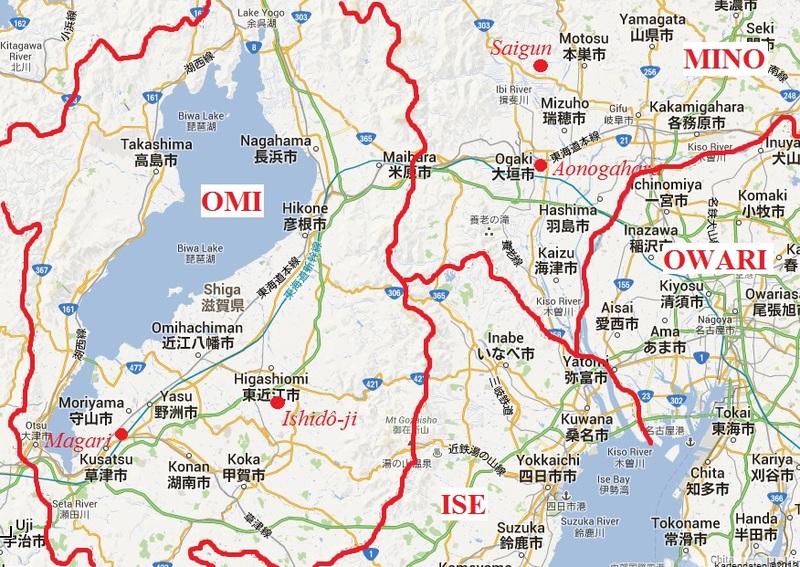 Thus just with the names Sukenaga, Suketsugu and Sukemune at hand and the Bizen workmanship of the Ishidô school in mind, the most obvious connection for them was probably the Fukuoka-Ichimonji Sukemune line. Well, we can not rule out that the earlier, i.e. the Nanbokuchô-era Sukenaga from the Takagi Sadamune and Kanro Toshinaga circle was from Bizen province. But as no works are extant it remains to be seen if he existed or if he was connected to the later Muromachi-era Sukenaga at all. At such considerations we always have to keep an eye on the fact that during the Edo period and the handing-over of lineages to the bakufu, the schools tried to present themselves in the very best possible light. So if you make Ichimonji-style blades and claim to descend from the Ichimonji school, it is better for you to provide a link to that school in your ancestry. So the Ishidô schools have probably Bizen origin but I would say that we can rule out Gamô Sukenaga in this respect.